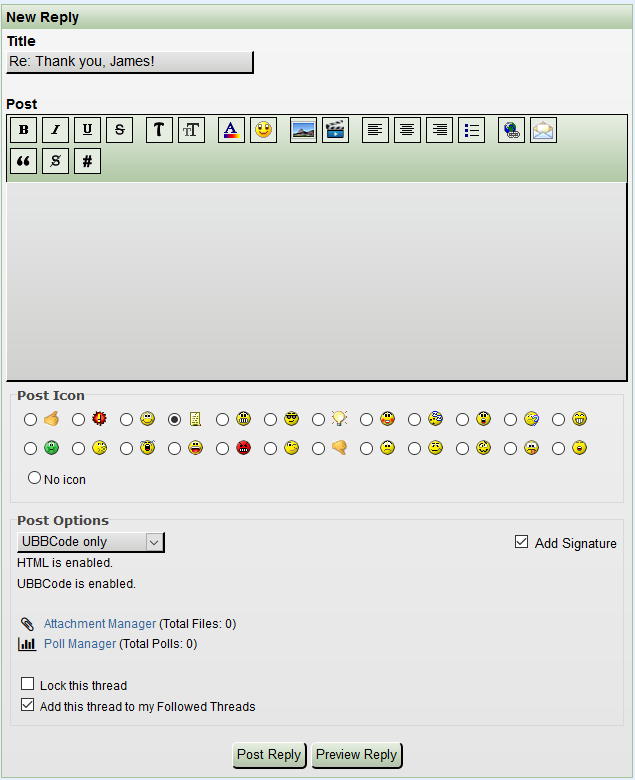 The CustomTag editor allows you to create a set of custom UBBCode to extend the functionality of your forum. In the stock package the supplied coding runs the Video Embed UBBCode, which allow you to embed videos from specific providers onto your forums. Tag coding and usage will vary based on each provider, so please pay close attention to the hints that you supply to your users in the text editor. 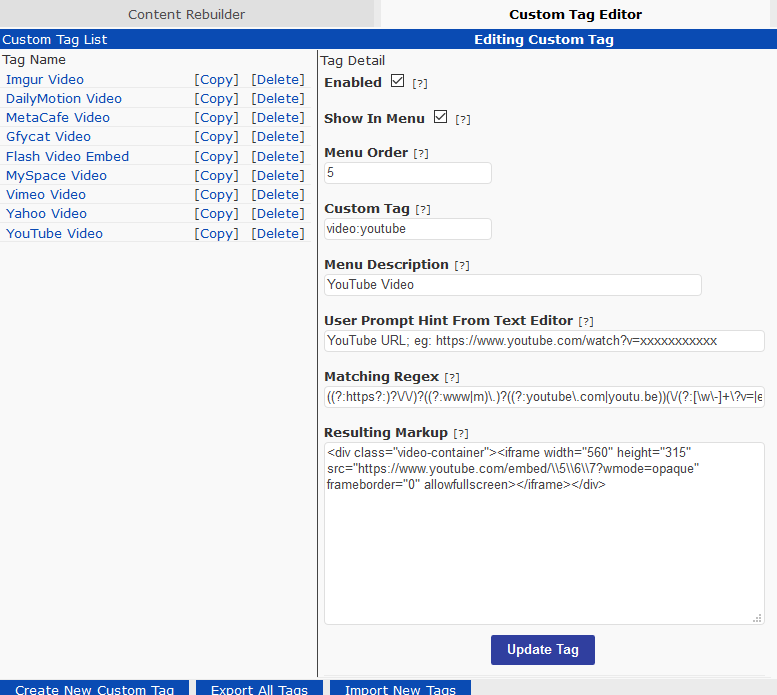 Video Tags in v7.6.0 are mobile capable, using the video_container class within UBB.threads v7.6. Mobile Capability is not supported in the v7.5 series, with exception to minimal support in v7.5.9.1. When you're on the New Topic or the Full Reply Editor (not the Quick Reply) you'll see an input box for adding Custom UBBCode to your posting; clicking this box will display all of the enabled UBBCodes (as defined by their settings in the Control Panel). If a UBBCode is not selected to display in the editor but it is still enabled, users will be able to enter the UBBCode directly into the editor (which will also work in the Quick Reply box). In the below image, the Custom UBBCode button looks like a video player icon. Enabled: Is this tag allowed to be used? Show in Menu: Should this tag be shown in the CustomTag dropdown? Menu Order: What order in the CustomTag dropdown should this item appear? Custom Tag: What is the tag code to listen for? Menu Description: What is a description of what this tag does? User Prompt Hint from Text Editor: What should we ask your users for when they click the CustomTag option from the dropdown? Matching Regex: What is the regular expression coding for the URLs supplied by this service? Resulting Markup: What HTML should we use as the output? You can import new UBBCode by selecting "Import New Tags" on the bottom of the Custom Tag Editor; new versions are released with the install archive, and can be imported by using the file selector and navigating to the install archive files in the "/install/custom_codes" folder, looking for "tags.php". Any new, imported, UBBCodes may be duplicates of existing coding (will be prefixed by "[new]"), so you'll want to remove (or at very least, disable) your old entries, in order for the new ones to be used (as the older entries appear first, they'll be used first). Return to the Category "Features"